UH OH! Someone kept digging, (not the news media apparently) until they found a photograph. We thought the party crashing about a month ago was the first time the Obama’s and the Salahi’s had ever laid eyes on each other. Nooooooo . . . I knew there had to be a “Paul Harvey” version to this story. See the white guy in the white suit? Now see the blond in the white dress? 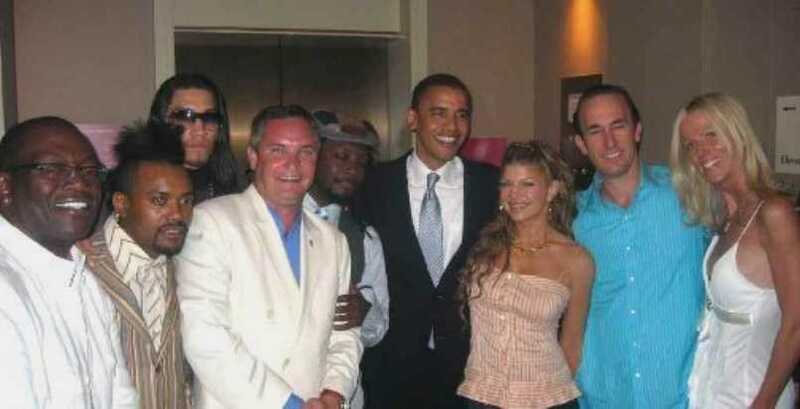 See the guy in the middle…hmmm-m-m. This picture was taken June 9, 2005. It seems Obama has known these two phonies for awhile, at least from the time he was a Senator. They’re getting all the press now as being “party crashers” and the Secret Service is taking the fall. Funny how this hasn’t come out in the press, don’t cha think? No wonder the couple who crashed Obama’s State dinner a few weeks ago keeps insisting they were invited guests. They know Barry from way back when he was still an Illinois Senator. Is Obama trying to throw the Secret Service under the bus? Michaele Salahi is getting quite a ribbing in the press for lying about being a Redskins cheerleader, but Tareq is the more interesting of the two to me. He has ties to Palestinian terrorists… Tareq is a board member of the ATFP- American Task Force on Palestine, which has quickly scrubbed its site of the fact. Thank the Lord for Google cache. And just who are the ATFP? Why do the same dubious tentacles seem to continually surround Obama? The fact that the ATFP is scrubbing information on Salahi from their website suggests possible damage control coordination between the ATFP and the White House. If the ATFP was acting independently, there would be no reason to scrub Salahi’s name from their site. It looks like Salahi was an invited guest to the dinner, that he was “outed,” and the administration had to come up with a rational excuse for his presence. Now the Salahis want to sell their story…they’re a little broke these days, but they still live VERY high on the hog. The Secret Service has already apologized for the incident, but they may clear their names if the Salahi’s start singing… If someone with ties to the American wing of Hamas can get face to face with the President without the Secret Service realizing it…that is a major security lapse. However, if Obama’s people knowingly allowed Salahi in and are now throwing the Secret Service under the bus to cover themselves, that would be a major scandal. Some in Congress are calling for an investigation. Something is VERY fishy in this White House, AND THE SMELL GETS WORSE EVERY DAY!